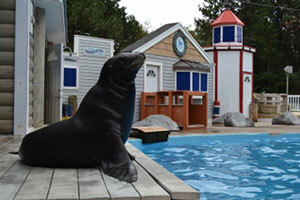 Kanuk is the seventh California sea lion rescued by Oceans of Fun at the Milwaukee County Zoo. Home to California sea lions, Atlantic and Pacific seals, Oceans of Fun is an interactive educational facility dedicated to the field of marine mammal science and education. On September 10, Kanuk arrived at his forever home, Oceans of Fun, at the Milwaukee County Zoo. He arrived safely thanks to a collaboration between Oceans of Fun team members and the Chicago Zoological Society at the Brookfield Zoo in Illinois. Since arriving, Kanuk has been making friends with Colby, Diego, Geneva, Makaia, Sonoma, Talise and Ripley. He is also building trust, respect and love with his keepers. Originally from San Pedro, California, Kanuk is thought to be 4 years old. He was found off the coast stranded, malnourished and dehydrated. Kanuk was rehabilitated and released back into the wild three times. Each time he was found stranded. Deemed non-releasable by the National Oceanic and Atmospheric Administration, NOAA, Kanuk lacked necessary survival and foraging skills. Scientists believe rising ocean temperatures drove fish farther from the shore making it more difficult to forage for food. Visitors can see Kanuk and his friends any day during Zoo hours. Oceans of Fun is open year-round depending on weather. Shelley Ballmann, Oceans of Fun President, said, “We hope that when you come, you learn about our amazing marine mammals and want to do your part in saving these animals and their environment.” Oceans of Fun presents shows daily at 11:30 a.m. with an extra show at 1 p.m. on Saturdays and Sundays. Guests can also attend daily photo sessions and animal feeds at 10:30 a.m., 11:30 a.m., 1 p.m. and 2:30 p.m. on Saturdays and Sundays; weather permitting. Zoo visitors looking for a more up-close, interactive and personal experience can book an Aquatic Adventure! For more information visit oceansoffun.org.